Every Saturday since November 17, yellow vests are mobilized everywhere in France. Update on the gatherings already under way and those planned in the South-West. Fifty people, employees of the Ford factory Blanquefort mobilized at the call of the union CGT and yellow vests from the north of the Gironde, have invaded this Saturday morning the Ford dealership from Lormont. "The yellow vests and Ford Blanquefort same fight" indicated a flyer distributed on the spot. The delegation entered the showroom of the concession in a rather good-natured atmosphere. In Bordeaux, a Facebook account of yellow vests announced a rally at 1 pm on the Place de la Bourse. Public transport has been interrupted since 11:30 and several public places are closed. Bazas. 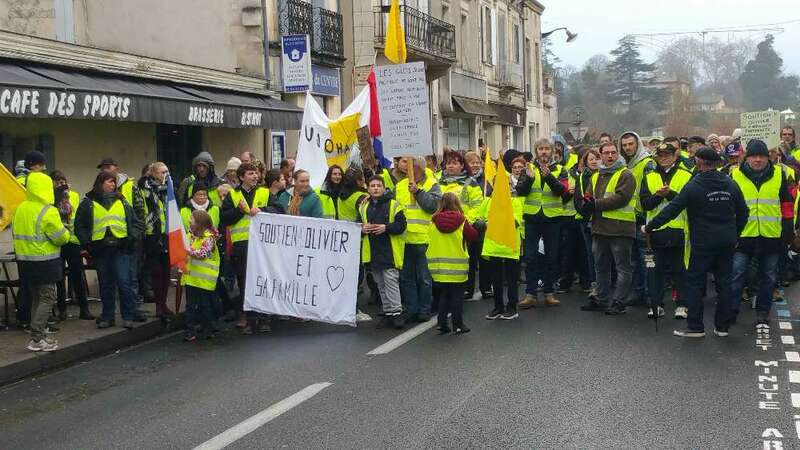 It is under a fine rain that it is slender the march organized by the yellow vests of Bazadais this Saturday morning, in support of the firefighter, Olivier Béziade, wounded last Saturday in Bordeaux and his family. A good hundred demonstrators walked the streets of the city chanting the usual slogans, stopping in front of the Sports Bar, to sing the Marseillaise, before going to the Cathedral Square, very busy on this market day. 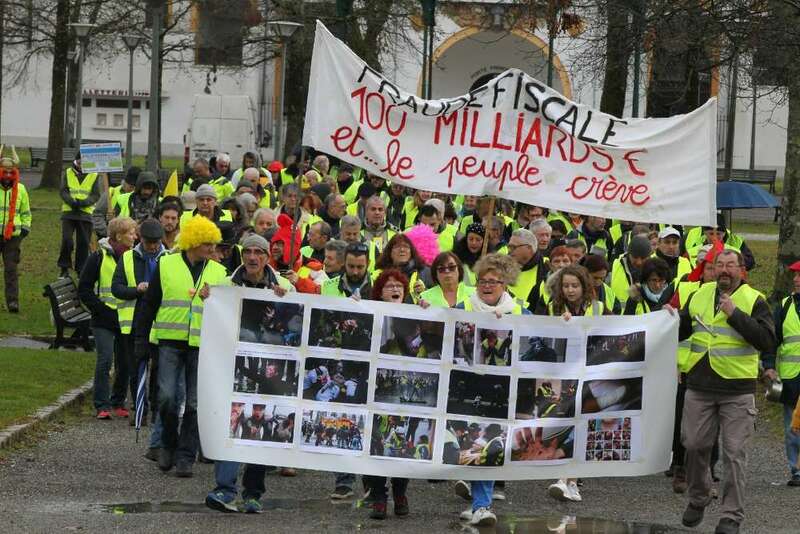 At 10 am, before the joint demonstration with the yellow jackets of Bigorre and Gers this Saturday evening in Tarbes, 400 yellow vests were launched in Pau. The slogans are unchanged and the great national debate does not inspire them. "It's communication, to try to calm the movement all our demands are evacuated immediately," explains Christophe who will not participate. "We can not both shout Macron resignation and participate in its debate." Some recognize a first in the democracy but they estimate that the dice are piped. "It's a small step forward but it's skewed, it's a shame," said Pierre, retired 69-year-old. At the height of the demonstration, up to 500 yellow vests were gathered. Like previous Saturdays, 250 yellow vests found themselves at the foot of the bullring. Dax with always the same slogan: "Do not give up". At the head of the procession, photos of protesters, injured by flashball shots in recent weeks in Bordeaux or Paris. "Here, unlike other cities, it's quiet enough and everyone goes by without highlighting their political colors or their union membership," explains a yellow vest of the first hour. "There are, from time to time, conflicts between us, but overall, we all move in the same direction," confirms another. In Dordogne, a departmental action is planned in Bergerac. The appointment is announced at 1:30 pm place du Foirail. In Charente-Maritime, a rally is announced Place de Verdun at 14 hours in La Rochelle. The yellow vests of Rochefort should join La Rochelle, those of the island of Ré and Saintes will go to Niort.